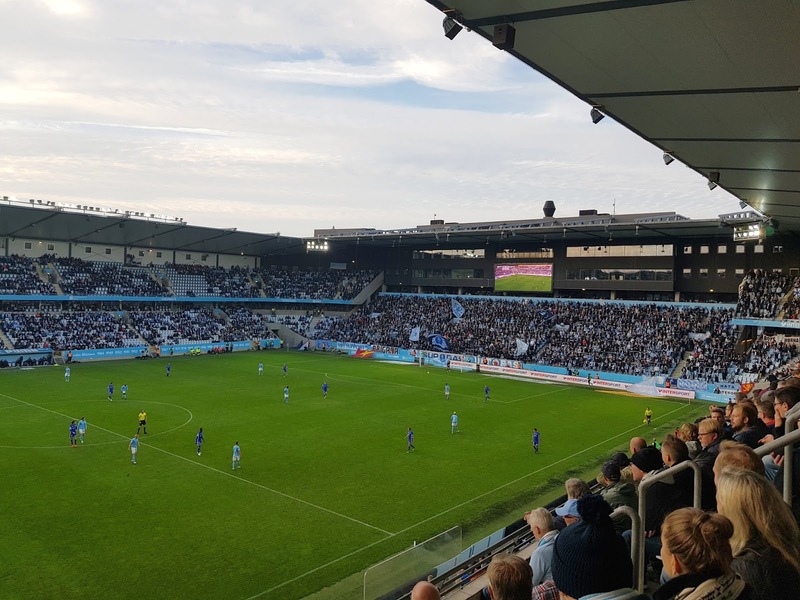 My twenty-sixth ground of 2018 was on Sunday 30th September at Stadion in Malmö, Skåne County, Sweden. 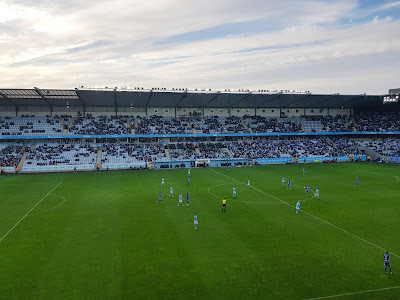 The match was Malmö vs. Sundsvall in the Swedish Allsvenskan. Stadion is located in the Solbacken area of Malmö to the south-west of the city centre. Just over a mile south of Triangeln railway station the venue sits within a complex known as Stadionparken. This is an area of the city dedicated to green space where two stadiums sit side-by-side with northern neighbour Malmö Stadion being the other arena. 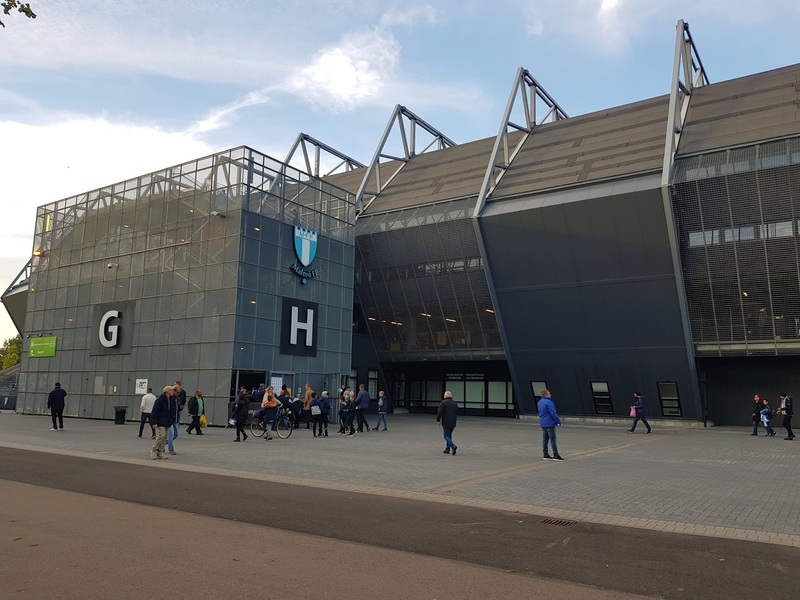 Malmö Stadion doubles as an athletics stadium and was the home of Malmö FF between 1958 and 2008. In 2009 the club moved to their new home at what was then known as the Swedbank Stadion. 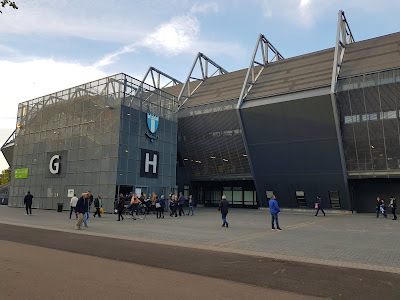 With this naming rights deal now elapsed the venue has reverted to the simple name of 'Stadion' which is somewhat confusing with the old ground Malmö Stadion next door. The stadium is predominantly a two-tier bowl with the northern end the only exception to this. The northern end is a larger single-tier, around three-quarters of the height of the rest of the viewing areas. This tier entirely consists of rail seating so it is utilised as a terrace for domestic games and seating for European games. It is inhabited by the club's ultras so a large amount of the atmosphere comes from this section. Above the seating level is corporate boxes as well as a big screen showing live footage of the match. The exterior of this stand also houses an O'Leary's Sports Bar, the club shop and a gym. The eastern and western sides are pretty similar in nature with both having two tiers of seating with corporate viewing areas at the back of the lower tier. The western side does have a few additional items though as it contains the TV gantry at the back of the upper tier, a media section in the middle of the lower tier and sunk dugouts by the pitch. The southern end has two tiers but a small section of the lower tier is assigned to rail seating that is used as standing areas for away supporters. There is also a second large screen TV relaying match action. Finally there are more hospitality areas at the back of the lower tier of each of the four quadrants - as is often the case with newer stadium the corporate facilities are certainly well catered for. With the rail seating the venue has two differing capacities - for domestic games this is 22,500 (18,500 seated) while for European games it maxes out at 21,000 (all seated). Both teams were in the top half of the table going into the game with the hosts one place outside the Europa League places. 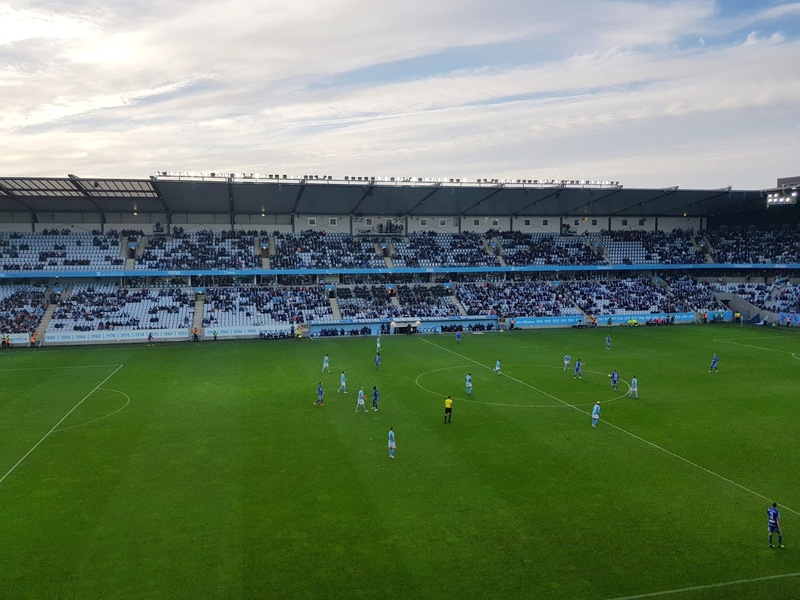 From very early on it became apparent that Malmö would be allowed a lot of the ball with Sundsvall happy to sit back and counter where they could. This almost paid off for them in the 14th minute when they got the ball in the net only to see an offside flag deny them the opener. The home side went close in the 21st minute as a nice passing move in the final third saw the ball laid off to Søren Rieks on the left side of the goal. He curled a shot to the far post which beat the keeper but came back off the post before rolling to safety. Just before the half-hour mark another chance went begging when a free-kick was whipped to the right side of the area and Lasse Nielsen blazed wide from six yards out. 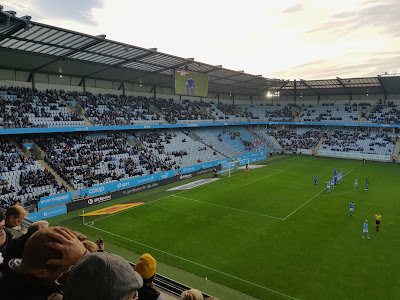 The opportunities kept on coming with the next one appearing in first half injury time - there was a scramble in the Sundsvall box but despite their best efforts Malmö couldn't squeeze the ball home. Into the second half and the game fell into the same pattern. In the 52nd a cross from the right was met by a glancing header by Marcus Antonsson - it looked for all the world like it would end up nestled in the corner but ended up just the wrong side of the upright. Around the hour stage there were two chances in quick succession as Fouad Bachirou curled an effort just past the post from 12 yards out and straight after this a 25-yard drive from Markus Rosenberg brought a save from William Eskelinen in the visiting goal. The final twenty minutes saw the hosts chalk up corner after corner after corner with no results. The stats spoke for themselves with Malmö having 67% possession and 21 corners throughout the game. Sundsvall though kept compact and left Malmö with the goalless draw they came for much to the displeasure of the home fans.